Luxurious oceanfront accommodations are in store for your family when you choose Atlantis Villas for your next North Myrtle Beach vacation. Top-of-the-line North Myrtle Beach vacation rentals comprise this oceanfront resort and they are designed and furnished so that you will have an incredible North Myrtle Beach vacation experience. The amenities are plentiful! These luxury North Myrtle Beach condos have at least six bedrooms with five baths, though you can reserve an eight-bedroom, seven-bath North Myrtle Beach rental at Atlantis Villas, too. These vacation units can accommodate up to 26 people. Some of the bedrooms have one bed while some of the bedrooms have two beds. All of these North Myrtle Beach rentals have a sleeper sofa. More than one bedroom in each of these North Myrtle Beach condominiums features balcony access so several people can awaken as the sun rises on the Atlantic Ocean and into your plush accommodations. The living space includes an accommodating kitchen with a dishwasher, microwave and a double refrigerator. A washing machine and clothes dryer are provided for you in these condos in North Myrtle Beach, SC, a convenient aspect to your North Myrtle Beach vacation. There are plenty of televisions and oftentimes more than one DVD player in each of these North Myrtle Beach condo rentals, too. Some of the North Myrtle Beach vacation rentals at Atlantis Villas have high-speed Internet access, which can be most convenient as you can peruse restaurant menus, check golf course tee times and look at show times for nearby North Myrtle Beach live entertainment theatres without leaving the comfort of your luxury North Myrtle beach vacation condo. 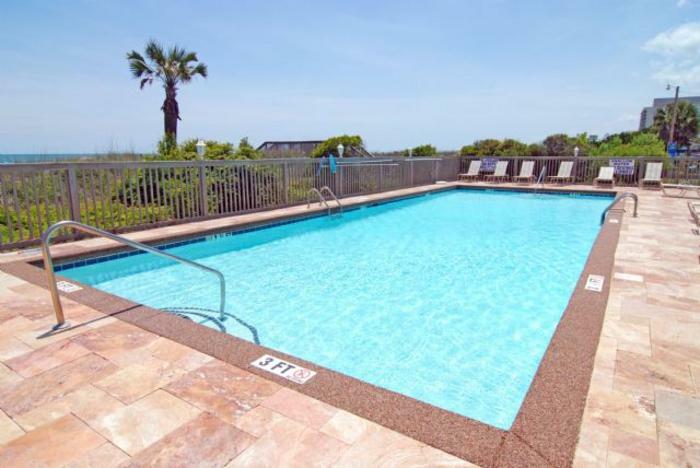 What makes these North Myrtle Beach rentals especially luxurious? They each feature a game room with a pool table. In addition to an accommodating kitchen and a large number of bedrooms, these North Myrtle Beach condominiums have a game room, too. Play pool with your family and hang out one night basking in your luxurious North Myrtle Beach vacation rental. Make popcorn and play games and create North Myrtle Beach vacation memories with your family or friends. Furthermore, these condos in North Myrtle Beach, SC have a Jacuzzi tub. Relax completely in the solitude of your own private Jacuzzi tub. This amenity is especially nice after you spend all afternoon walking the nearby outlet malls or playing a challenging game of Myrtle Beach golf. Get your earphones and listen to your favorite tunes while the bubbles soothe and the jets ease your tired muscles. Soaking in the Jacuzzi tub is a marvelous way to rejuvenate your body and mind for a night out on the town during your North Myrtle Beach vacation. The oceanfront sun deck at Atlantis Villas has chairs that surround the bright blue swimming pool and hot tub. The Atlantis Villas swimming pool is heated from April through Thanksgiving so you can enjoy a comfortable swim even when the North Myrtle Beach weather cools ever so slightly. Take your favorite novel or a stack of magazines to the pool deck and pick a chaise lounge chair. Get a suntan while catching up on your reading materials. Take pictures of the kids splashing and playing and venture out to the beachfront every hour to play in the sand and find cool seashells. Atlantis Villas is comprised of non-smoking North Myrtle Beach vacation rentals with ocean views from private balconies. Fresh air and salt-scented breezes are all yours when you vacation at this North Myrtle Beach resort. Covered parking and a centrally located elevator will assist you getting your luggage, groceries and shopping excursion finds from your car to the front door of your comfortable North Myrtle Beach vacation rental. The Ocean Drive location of Atlantis Villas is phenomenal. This area in North Myrtle Beach, SC is hopping with a nostalgic vibe. Shag dancing was born here and there are a handful of beach clubs that feature live beach music that gets all the shag dancers out to the dance floor. There are shops and restaurants along Main Street, from which Atlantis Villas is only eight blocks away. Get a refreshing cocktail at a waterfront restaurant and order amazing seafood for breakfast, lunch and dinner during your North Myrtle Beach vacation. In North Myrtle Beach you can dine on a boat, on a pier, on the beachfront and in a live dinner theatre. Get dessert from a family-friendly ice cream shop. Try a locally brewed beer. Feast during an all-you-can-eat oyster roast or take your appetite to one of the North Myrtle Beach area’s famous seafood buffets. North Myrtle Beach area amusements include Barefoot Landing, Broadway at the Beach and The Market Common where shopping, dining and entertainment nestle side by side. A myriad of water sports are in close proximity to Atlantis Villas and there are numerous live entertainment theatres in town that feature award-winning productions with singing, dancing and comedy. A North Myrtle Beach vacation at Atlantis Villas will be one to remember as you enjoy the on-site luxury and the surrounding attractions.